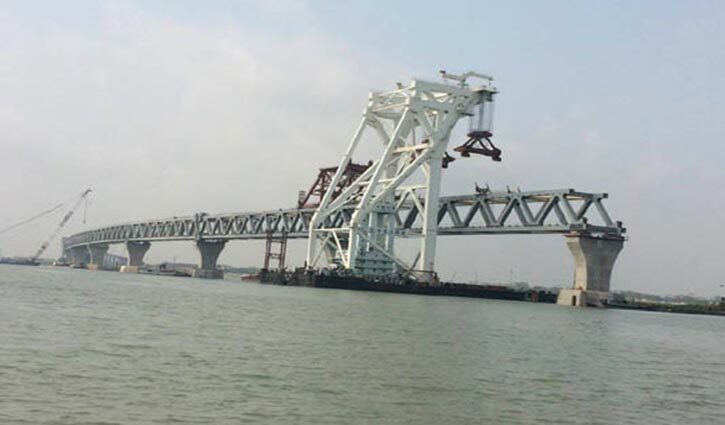 Staff Correspondent: The ninth span of the Padma Bridge has been installed. As a result, around 1,350 metres of the Bridge is now visible. The 150-meter long ninth span was installed on two pillars (number: 34, 25) at Janjira point on Friday. Construction work of the bridge has moved one step ahead through the installment of a new span. Earlier, the installment work was started around 7:30am today. The ninth span was scheduled to be placed on the pillar on Thursday but it is not possible due to anchoring problem. So, the ninth span was installed this morning changing the previous schedule. Project sources said that the construction work of 21 pillars of 42 is completed fully. So far eight spans at Jajira point and one span at Mawa point of the bridge have been placed.